Despite the way it's categorized on Netflix, this movie is definitely not a romantic comedy. It's witty, and it's about relationships, kind of, but it doesn't have a kiss at the end where you know the main characters are going to be together forever. Which is excellent, because I was definitely not in the mood for a movie like that. 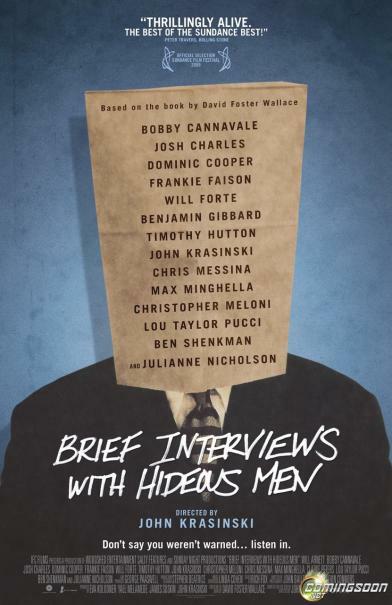 Instead, "Brief Interviews with Hideous Men" was incredibly realistic, thought-provoking, painful, and yet strangely comforting. Go watch it! Right now! It's on Netflix watch-instantly. Then come back and read the rest of this post, because I don't want to ruin the ending for anyone. ....ok, if you're reading down this far, I'm assuming you've either gone and watched this movie, had seen it previously, or that you just don't mind hearing about a movie before watching it yourself. I've been questioning lately whether I'm just a really bad judge of character. Watching 'Brief Interviews with Hideous Men' made me think that no, it isn't just me. It's not just that I'm easily manipulated, it's an actual traceable process that happens when a relationship is falling apart. There's the twisting of words into phrases you never thought you'd hear, the justifications that have nothing to do with what's really going on, the cruelty to cover up shame, and the self-imposed martyrdom that you're supposed to comfort and tell them that what they're doing is okay, and that you understand. It's this last part that I find the most interesting and bizarre and baffling, and it's one of the major themes of this movie. The way that selfishness is disguised as selflessness, and how even the person doing this seems to get sucked into believing it. 'Brief Interviews with Hideous Men' was adapted by John Krasinski from David Foster Wallace's novel of the same name, and it was very strange to see John Krasinski, whom I always think of as sort of sweet and cuddly and funny guy from watching The Office, playing someone that I really, really didn't like. When he was making his monologue at the end, after the 'interview subject' screen flashes, it became painfully clear that he was saying the same things that the other men had been saying. The others were perhaps not made out to be as intelligent, and didn't manipulate their words quite as effectively, but the same intent was present. In a way, though, that's what made this movie comforting. The way that each man interviewed managed to completely deny responsibility for his actions showed that it wasn't something restricted to a "type." It isn't something that the other person in the relationship provokes, it's a self-defense mechanism that, for some people, kicks in and is almost impossible to reverse once it's started. Any sense of rationale gets completely lost and they work themselves into a tizzy of self-pity and self-glorification all at once. In any event, this is definitely a movie worth watching. The writing and acting are both fantastic, and the plot is engrossing in a very unsettling way. Yaaay! I'd love to know what you thought of it-- I didn't know what to do when John Krasinski showed up, because I didn't like his character, of course, but... he's John Krasinski! He's adorable!